I always bake something the day before I have a test. 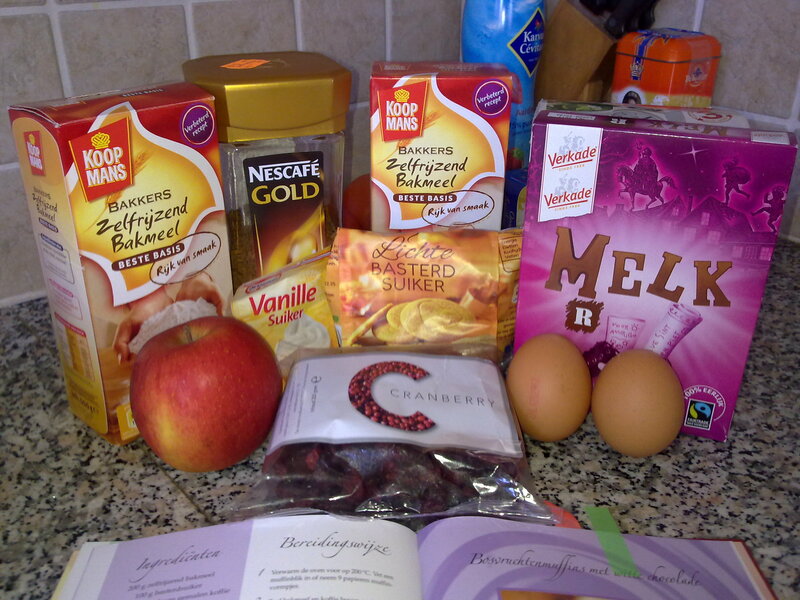 If it’s a cake or cookies or whatever; I HAVE TO BAKE! It just helps me calm down and relax, which is the exact thing I need at those moments and which was yesterday as I have a test today. Works a lot better than meditating and it’s productive too! Voilà, what more could I wish for? When I saw we had some dried cranberries left in the pantry I decided I wanted to bake something with those in it, as I was becoming addicted to food that had blueberries in it. Blueberries, cranberries; I want to try all the berries! Have I already told you I’m a closet fan of blackberries? Herewith I don’t mean the smartphone, but the actual fruit you can eat. No? Well, now you know. The day before yesterday I already started my search for a recipe for cranberry cupcakes and I found one in a cookbook I had gotten as a gift from my brother some time ago. It’s actually a recipe for blueberry muffins, but hey, the point was that I would use these cranberries I had found, not that I would actually leave my house to go grocery shopping! Let me be lazy, please? And because of my laziness I made another adjustment in the ingredients and didn’t use the white chocolate they’re recommending, but milk chocolate instead. No one in our home eats milk chocolate, because we’re all die-hard dark chocolate fans, so usually when we get those as a gift, we either give them away or use them for baking. These milk chocolates were actually already over due, but because Google told me that when it comes to chocolate it doesn’t matter if the package says that it’s over due as long as it’s unopened, I decided to use it anyway. In the end I had to go to the supermarket anyway because I found that I was out of whole milk. Damn it. By the way, I’ve altered the original recipe a lot; leaving some ingredients out and adding new ingredients or altering amounts, so it’s kind of become my own recipe now, hehe. The cookbook the original recipe is from that I’m using is Dutch and I realize that the sizes differ from the sizes that are usually used in English. This website could help you use the right amounts. These aren’t all of the ingredients as I forgot a couple when taking this picture, whoops. Luckily I didn’t forget them during baking! Why is there an apple in this picture? Who put it there? Eh? Preheat your oven on 160 C (or 325 F). Put the cupcake liners in a cupcake tin and grease them. I usually use oil and a brush for greasing, but you can use butter too if you’d like. Sift the self raising flour, sugar, vanilla sugar and coffee in a bowl and mix them with a spoon. Make a pit in the middle. Beat the eggs in another bowl loosely with the oil and the milk. Add this mixture to the flour and mix it shortly using a mixer. Then add the chocolate and cranberries and stir them through the mixture using a wooden or silicone spatula. When you’re finished, distribute your cake dough over the cupcake liners. 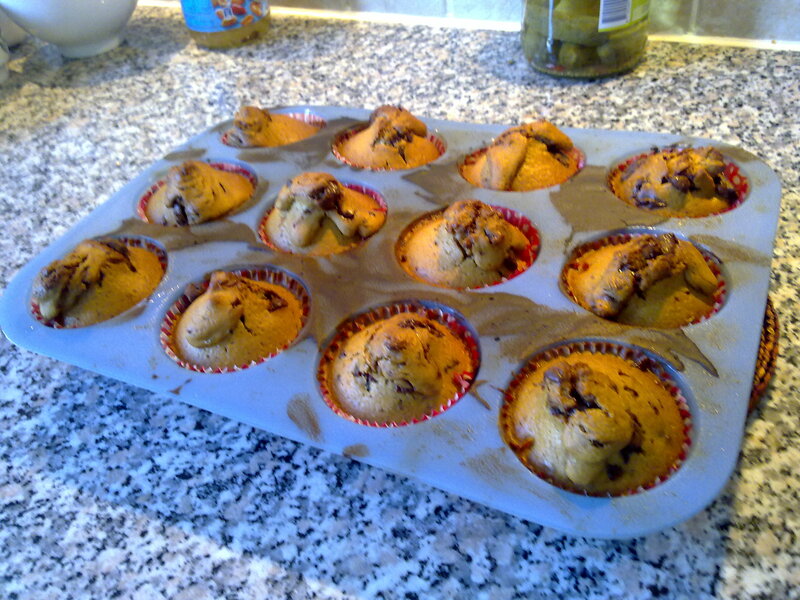 Bake the cupcakes for 30 minutes in the middle of the oven until they have a golden brown colour. Please don’t follow my example and let your cupcakes come out this big and ugly. Just fill them up to two third and you’ll be fine. Don’t forget to change the degree on your oven and pay attention to your baking time! The black colour on my cupcake tin isn’t supposed to be there either. It was because a little of the dough was spilled when filling the liners and well, this is what you get then. No biggie, just don’t eat it. The amount of time and on which degree you bake your cupcakes at depends on for how much you’ve filled them. I’ve filled them to the top, because I wanted to make only one batch of cake, and if you follow my example it means that the previous degrees and time I’ve just mentioned are the ones you should use. If you go for less ugly and more cute cupcakes and you choose to fill your tin only up to two thirds, preheat your oven on 180 C (or 350 F) and leave the cupcakes in it for 25 minutes. Keep checking your oven to see if they have a golden brown colour. 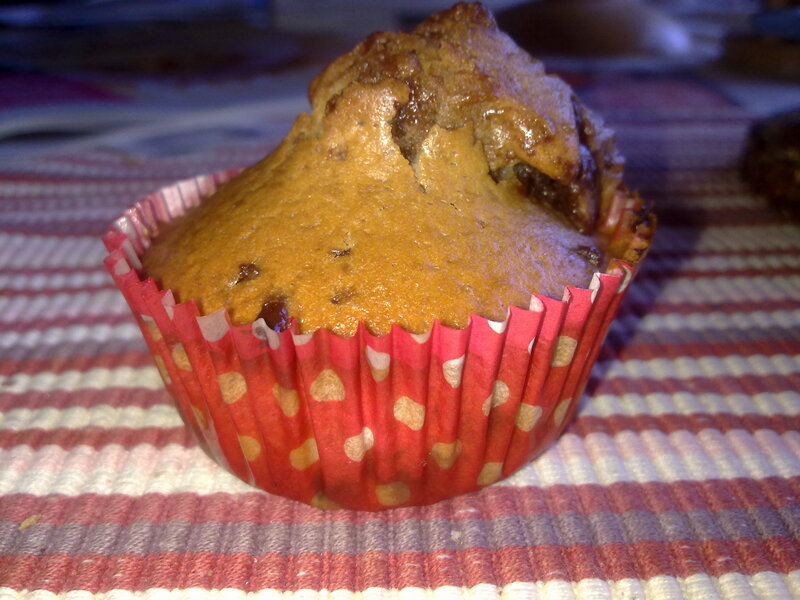 Credits: I used the cookbook ‘Chocolade’ by Elizabeth Ferretti for the recipe. © 2004 Top That! Publishing plc.